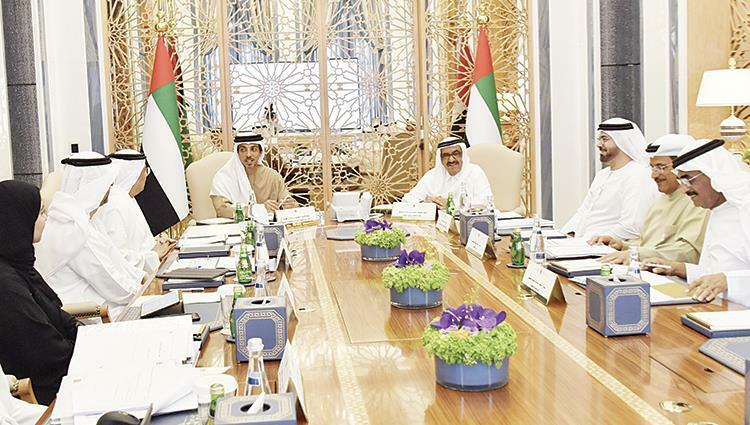 ABU DHABI, 10th March 2019: The UAE Finance and Economic Committee discussed components of the draft general budget of the Federation for the fiscal year 2020 and looked into measures taken by the Ministry of Finance to update the draft budget. The meeting took place in the presence of H.H. Sheikh Mansour bin Zayed Al Nahyan, Deputy Prime Minister and Minister of Presidential Affairs; Mohammad bin Abdullah Al Gergawi, Minister of Cabinet Affairs and Future; Sultan bin Saeed Al Mansouri, Minister of Economy; Obaid bin Humaid Al Tayer, Minister of State for Financial Affairs; and Dr. Abdullah bin Mohammed Belhaif Al Nuaimi, Minister of Infrastructure Development. During the meeting, the Committee reviewed the draft general budget of the UAE and a number of topics, the most important of them being the general budget of the Union for the fiscal year 2020 and additional financial appropriations for the year 2019. The committee also discussed requests for additional financial allocations for 2019 submitted by federal entities in Q1 and took appropriate decisions accordingly. The committee also reviewed the projected cash flows for the fiscal years 2019 and 2020 as well as those for the fiscal year 2019-2020. Projects which aimed to improve efficiency and effectiveness of public services and develop financial measures were also looked into. The Committee also reviewed the procedures carried out by the Ministry of Finance to update the draft budget 2020 and directed the completion of the procedures in accordance with the financial circular issued by the Ministry of Finance in this regard.